The Mayor's Office of Immigrant Affairs has volunteer opportunities for several important civic projects. The Mayor’s Office of Immigrant Affairs has volunteer opportunities that they’d like Macaulay students to know about. 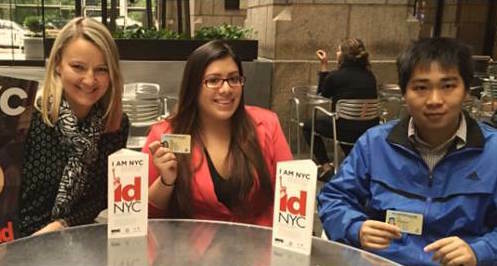 IDNYC is a free municipal identification card for all New York City residents, regardless of immigration status. The card is a tool of empowerment for New Yorkers, removing the barriers that many have to participating fully in the life of the city. IDNYC volunteers have the opportunity to reach out to communities in all 5 boroughs to increase awareness of the benefits of the IDNYC program and encourage new enrollments. Know Your Rights Forum volunteers: KYRF leaders help assist our facilitators with Know Your Rights Forums and inform their own communities about MOIA and other city services with information on city resources available for all New Yorkers. KYRF volunteer leaders also train new volunteers, and lead teams during rapid response events. Special Event and Rapid Response Volunteers: During these uncertain times, our volunteers assist at immediate response forums or town halls or actions and are trained to share information with the community about resources and rights for all New Yorkers, regardless of immigration status. Special Event Volunteers also participate in public events organized by MOIA, such as Immigrant Heritage Week. We Are New York: Regardless of background, everyone has the right to access city services and the right to thrive in a city like ours. WANY empowers immigrant New Yorkers by helping them practice English and learn about City Services through volunteer-led conversation groups hosted by diverse partners across the City’s five boroughs. Please fill out this form to get involved today. ABOUT the agency: New York City is a symbol of inclusion and multiculturalism in which people from all walks of life have the opportunity to thrive and be integrated into the civic, economic, and social life of the city. The Mayor’s office of Immigrant Affairs serves as a bridge between immigrant communities and city agencies as well as promotes policies that support the well-being of immigrants here in New York City. We offer different opportunities for New Yorkers to get involved and support our immigrant communities.